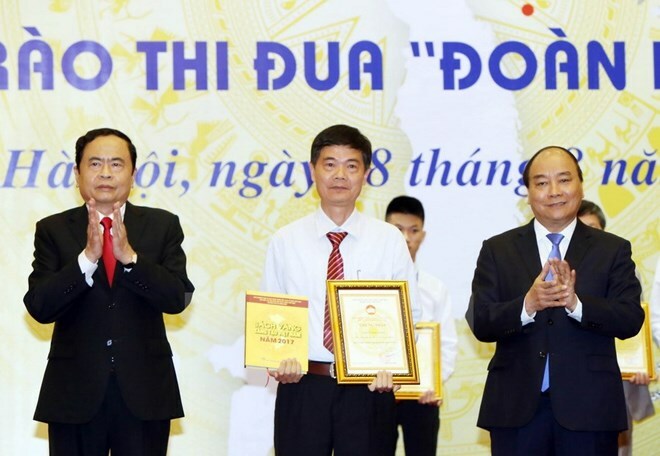 Hanoi (VNA) – Prime Minister Nguyen Xuan Phuc attended a ceremony in Hanoi on August 28 to launch the Vietnam Innovation Golden Book 2017. The book was published by the Vietnam Fatherland Front (VFF) Central Committee, the Ministry of Science and Technology, and the Vietnam Union of Science and Technology Associations (VUSTA). It is a collection of 72 outstanding science-technology projects and solutions selected from 141 works recommended by ministries, localities and VUSTA member organisations. President of the VFF Central Committee Tran Thanh Man said the book includes valuable initiatives to support the community, dealing with healthcare improvement, environmental protection, and socio-economic development in disadvantaged border, sea and island areas. Also at the ceremony, the VFF leader launched an emulation movement to promote innovation, enhance productivity, product quality for international integration among society, especially intellectuals, entrepreneurs, and workers at home and abroad. Addressing the event, PM Nguyen Xuan Phuc affirmed that the Vietnamese Party and State always encourage reforms and innovations, particularly in scientific and technological development. The Government has made due investment in science and technology and creates the best possible conditions for scientists to uphold their talents and creativity, he said.